I thought I remembered posting something about shamrock cinnamon rolls last year, but couldn't remember. With a little digging I found them! I think I know what we are having for St. Patrick's Day breakfast! I always love when little holidays like this fall on a weekend. I am sure every teacher everywhere is glad that St. Patrick's Day is on a Sunday too. 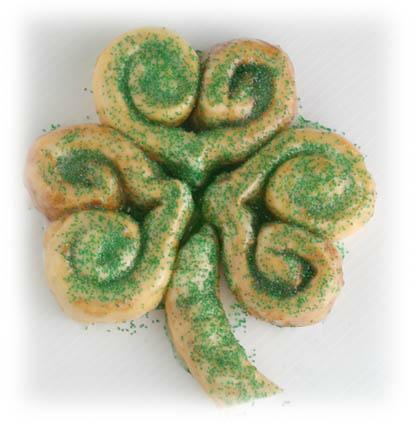 If you want to make these shamrock cinnamon rolls, here is the recipe from Rhodes. They use green sprinkles, but I think I would use a little bit of green food coloring in the frosting instead, but that is just because I am not a sprinkles person! Place one frozen roll on a microwave-safe plate. Microwave on high for 12 seconds. When cool, unroll one half of the roll then start rolling the dough from the unrolled end to form a matching spiral. When each spiral looks the same, pinch the dough between the two spirals to make a point at the bottom. Repeat with two more rolls. Microwave last roll on high for 12 seconds. When cool, cut off a piece for the stem. Arrange the 3 heart shaped rolls and the stem into a shamrock shape (use the leftover part of the last roll for additional shamrock stems). Glaze with cream cheese frosting and sprinkle with green sugar sprinkles. Oooh, I might do this! I've been trying to think of something fun, but very simple that I could do for St. Patrick's day. Levi is starting to "get" the holidays now and it is so fun to celebrate them with him.